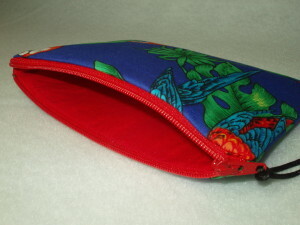 Padded zipper pouch, change purse, cosmetic pouch from Bags of a Feather in a deep purple tropical macaw parrot print. Scarlet macaws perch among lush tropical hibiscus blossoms and palm leaves in brilliant shades of red, orange, turquoise, and green. Lined in American Made brand cotton, and closes with a red zipper and silky black cord zipper pull. Interlined with multiple layers of lightweight fleece and stabilizer to protect cosmetics and jewelry. Carefully constructed with reinforced corner stitching and finished interior seams. 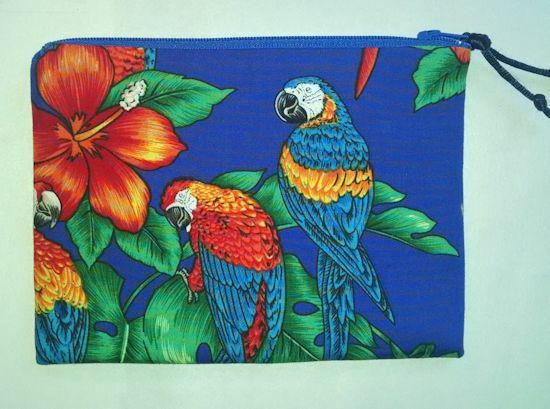 This cosmetic or zipper pouch is meant to last! Carry a taste of the tropics wherever you go! Hand wash and air dry, iron to smooth out wrinkles.